A couple of years ago the United States Golf Association announced it chose The Country Club in Brookline to host the U.S. Open in June 2022. That announcement set into motion a deep dive into what that could mean for the town ahead of negotiations with the USGA. “Can we handle 30,000 people?” asked Selectmen Chairman Neil Wishinsky, referring to infrastructure. “We believe the basic infrastructure is there,” said Town Administrator Mel Kleckner, adding that USGA knew how to convert the areas into mini cities. Late last month the negotiation team, which included the Parks Director Lisa Paradis, former Selectman Ken Goldstein, the Country Club’s PGI professional Tom Ellis and Kleckner made the case to the Board of Selectmen that Brookline is a great choice to host the U.S. Open in five years, despite some challenges with the scope of the event and the event layout. “It’s not like we haven’t seen it before and we are confident that the town can handle the logistics and we’re confident that the agreement will and must provide benefits to the town or else there’s really no point,” said Kleckner, noting the Country Club and the town have hosted a number of other major golfing events throughout the years. He also pointed out Brookline’s historical role in the game of golf. The Country Club was a charter member of the U.S. Golf Association, back in the 19thcentury, according to Kleckner. “And the Country Club was the site of the famous 1913 U.S. Open when a 20-year-old amateur golfer and Clyde Street resident stunned the golf world with a playoff victory. And that event propelled the game of golf in America,” said Kleckner, who added he himself is not a golfer. Selectmen approved a preliminary letter of intent with the USGA, creating the overall perimeters of negotiation, and authorized the creation of a negotiation team. The team is working on getting the USGA to come to some concrete sense of what it could look like. But the fact there are other U.S. Opens happening before the 2022 event has hampered progress there, according to Kleckner. The Country Club hasn’t reached a definitive agreement with the USGA, either he said. But he was optimistic about the end result. “The Country Club and town committed to a successful event in the town and we believe it will happen,” Kleckner told selectmen in February. The letter of intent in 2015 anticipates a definitive agreement. 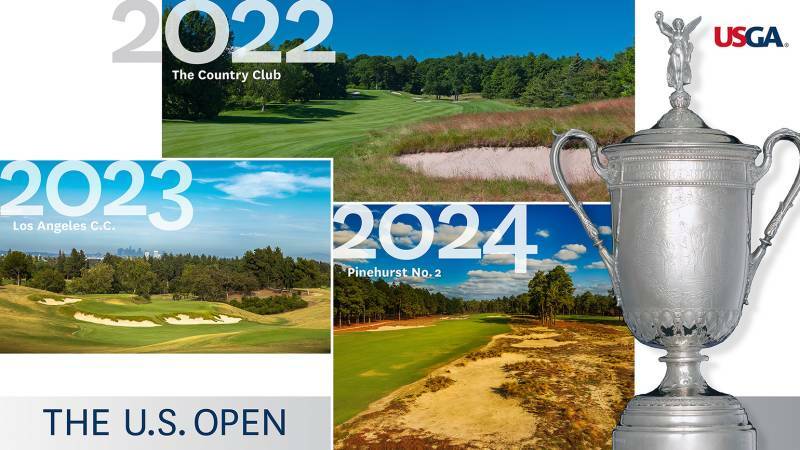 The golf world is already abuzz about the 2022 event. Main considerations, said Goldstein, include figuring out which properties will be involved. Goldstein said the USGA wanted to use Putterham Golf course as a welcoming area going into the venue, including the 37,000-square-foot Spectator Village for merchandise, food and beverage. Traffic, public safety, noise, licensing and business opportunities, and local business protection and promotion were also considerations that needed to be hammered out. He also said they were considering how to ensure no loss of revenue and to balance that with use of Brookline’s resources and making sure the course would be repaired and renovated. Ellis said the negotiation team went to the Oakmont U.S. Open in Pittsburgh to get an idea of how it could work in Brookline. They went back after a month to see how removal went and returned yet again to see the restoration progress. Some lessons they took away. The take down? “Certainly quite the process,” he said. Three months after the U.S. Open the Oakmont golf course began the restoration process, he said. But Paradis stressed that they were taking their time in the restoration process and that was not the intent when it came to Brookline. Next steps for Brookline? Paradis said as the negotiation team worked with the USGA her team planned to get more community involvement. She said the team met initially with some stakeholders early on, but she said they intended to bring those folks back to the discussion along with others in the community. Selectwoman Nancy Daly said she was skeptical of the plan, saying it could cause damage to the town-owned Putterham Golf Course and expressed concern about what it would mean to take it out of commission for a few months. Kleckner said he saw it as an opportunity to do upgrading work to Putterham. Paradis said the parks division did a preliminary survey to see if customers would return to Putterham after the US Open, most said they would, she said. Selectwoman Betsy DeWitt said she felt bringing the U.S. Open to Brookline could have its benefits. The Country Club has hosted the U.S. Open three times: 1913, 1963 and 1988, In 1999, it hosted the Ryder Cup. and was the site of the U.S. Amateur tournament in 2013. The club had also been a potential golf venue for the proposed 2024 Olympic Games. If it goes forward, the 2022 U.S. Open will be the 17th USGA event hosted by The Country Club, according to the USGA, putting it behind only Merion Golf Club in Ardmore, Pa. (18), for number of events.